Ben Affleck testifies about the Republic of Congo during a U.S. Senate Committee on Foreign Relations hearing on Capitol Hill Feb. 26, 2014, in Washington, D.C.
Ben Affleck isn't quite apologizing for not wanting his ancestor's slave-owning past to be revealed on the PBS genealogy show Finding Your Roots With Henry Louis Gates, Jr., but he did admit that finding out was "embarrassing." Leaked emails between the show's executive producer (and The Root co-founder), Henry Louis Gates Jr., and top Sony executive Michael Lynton explained a quandary that Gates found himself in after Affleck expressed concern about having the slave-owning information shared. When the episode aired in October, Affleck's ancestor, who at one time owned slaves, was not mentioned. Gates said that after reviewing all of the material pertaining to Affleck's segment, he decided that the slave owner's portion was not as interesting, so it didn't make the final cut. Gates added that a companion book is being released this fall and will include Affleck's full genealogical makeup. In a Facebook post, the actor, star of the upcoming Batman v Superman, admitted that he did lobby for the unpleasant historical finding not to be included in the episode. 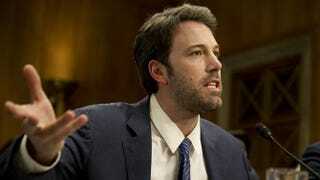 "After an exhaustive search of my ancestry for 'Finding Your Roots,' it was discovered that one of my distant relatives was an owner of slaves," Affleck, 42, wrote on Tuesday. "I didn't want any television show about my family to include a guy who owned slaves. I was embarrassed. The very thought left a bad taste in my mouth." He continued, "I lobbied [the producer] the same way I lobby directors about what takes of mine I think they should use. This is the collaborative creative process. Skip [the show's host, Henry Louis Gates Jr.] agreed with me on the slave owner but made other choices I disagreed with. In the end, it's his show and I knew that going in. I'm proud to be his friend and proud to have participated." Affleck also noted that his participation in the program was voluntary and added that the show "isn't a news program." "Finding Your Roots is a show where you voluntarily provide a great deal of information about your family, making you quite vulnerable," he wrote. "The assumption is that they will never be dishonest but they will respect your willingness to participate and not look to include things you think would embarrass your family." Affleck added that despite how the story became a part of the news, he is glad that he could participate in a broader discussion. "We deserve neither credit nor blame for our ancestors and the degree of interest in this story suggests that we are, as a nation, still grappling with the terrible legacy of slavery," he wrote. "It is an examination well worth continuing. I am glad that my story, however indirectly, will contribute to that discussion. While I don't like that the guy is an ancestor, I am happy that aspect of our country's history is being talked about."